You may know it as a flyer, a leaflet, a handout, a circular, a pamphlet, a bulletin, a handbill, or even a playbill. Whatever you call it, that little piece of paper is something that still has a presence, even in this digital world. 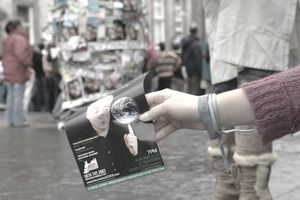 "A small handbill advertising an event or product." It really is as simple as that. Or is it? While it may be just a simple piece of paper printed on one or both sides, it's also an eye-catching way to grab someone's attention, and promote sales...if it's done right. Remember that people see advertising messages every other minute, especially when they're out and about on the streets. Some say we see up to 7,000 ads a day, though most of those are on phones and tablets. You need to make something that has a great impact in order to really be seen and remembered. Sadly, most flyers go straight in the trash, and trashed flyers are a lot of wasted time and money on your part. So how do you break through the clutter and make a difference? How do you create a flyer that is not instantly tossed in the garbage or thrown into the gutter? Here's a quick 7-step process to help you create a great flyer that gets noticed. On your own or with a business partner or colleague, take some time to write down as much as you can about your business and what you're advertising. Don't be afraid to put nonsensical ideas down on paper. Sometimes the most bizarre ideas from your brainstorming session can come together to form one big, money-spinning idea. When you have exhausted every possible avenue, step back and look at what you have written down. Walk away. If you have time, come back the next day. This is not always necessary but can work wonders. When you come back to the whiteboard or sketch pad, what stands out? That's your idea. A great headline or visual is only half of the battle. Now, you need to push the idea further. What can you do to make it really stand out? Do you have a way to fold it? Can you print it on something unusual? Is there a way to make it smell or look like something that people cannot ignore, like a parking ticket? What can you do to really break through the boundaries and the clutter? This is a world filled with advertising messages. What makes this one different? Why should anyone spend their valuable time with it? What are you going to do to make it really stand out, without being salesy? If you have a great offer, you may not need a great headline. After all, you could say "the way to anyone's heart is through a complimentary pint of ale," but FREE BEER conveys the same message and will catch anyone's eye. Don't be too clever for your own good. You may be able to do it yourself thanks to modern desktop publishing and online templates, but don't be afraid to call in professional help. First, you need to make sure your design has enough space to make the headline and the offer stand out. Don't crowd the typography or add too much copy. Next, think carefully about imagery. You cannot just grab whatever you want from the Internet as most photos have rights. You can get stock photography at reasonable prices at sites like stockunlimited.com or for free at sites like pexels.com. Finally, check your flyer twice for any errors. You don't want to see spelling errors or other issues once the printed flyer is in your hand. Don't skimp on printing, unless the idea demands it. However, get ready to negotiate. Printers do it all the time, especially if they know you will be a repeat customer. Respect the fact that they are in business to make money, but if you can barter with them or combine your run with that of another small business, you may get some great discounts. Now you have your flyer in hand and it looks great. Now it's time to think about how you will spread it to the right people. You don't want to throw your money away, and nothing is more disheartening than spending time and money on something you see littered along subway tunnels and trash cans. Find a way to give your flyer to people who look bored, people waiting for their partners to finish shopping in a store or watching their kids at a play area in the mall. You have an audience desperate for something to read so give your flyer to them. Putting them under the windshields of parked cars can work, but again, think about the audience. Will they simply rip it off and trash it?